Six and a half feet tall. Six and a half feet wide. No, I'm not describing any freakishly large bit of anatomy (skin), I'm describing a crossword puzzle. 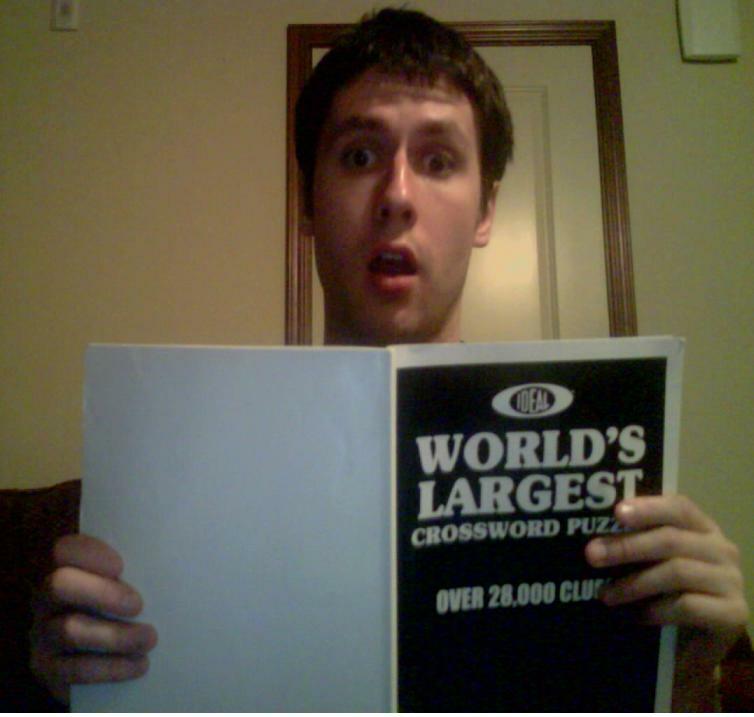 A freakishly large skin-sized crossword puzzle. My girlfriend knew I dabbled in crossword puzzles,so she got me this monstrocity for my birthday. But my birthday was in September, and if you look closely at the picture, you'll probably see it's not very well filled. Of the 28,000+ questions, I might have cracked 700 answers. I fully plan on being done with it next week. 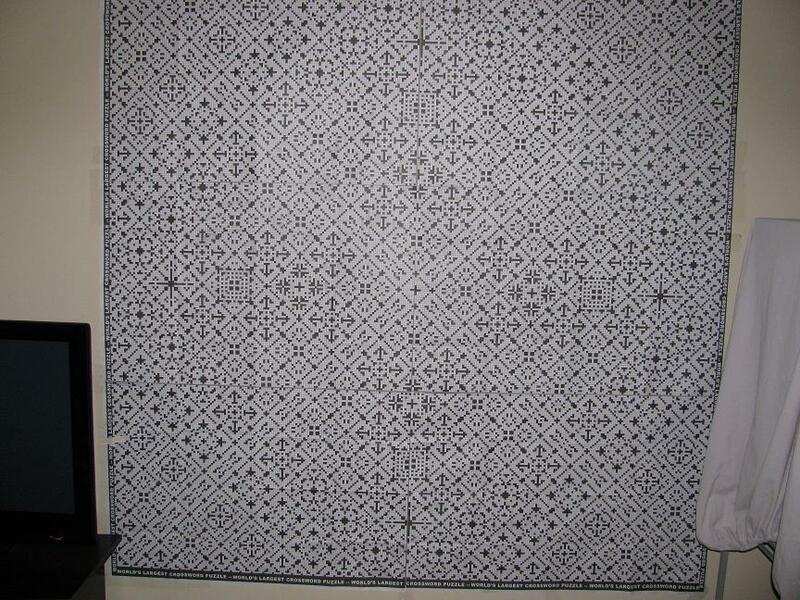 It looks like a Magic Eye. But no, no it's not. That is, next week after I eschew eating, all forms of sanitation and cheatily employ Google, but next week I shall be done nonetheless. Only after going through this intense process can someone, anyone, finish an undertaking as large as this one. Monstrous size aside, I can't even remember the last time I completed a normal crossword puzzle. And even if I do somehow recall when I did it, odds are it was a Monday edition consisting of 180 easy questions like “What is the first word in this question?” Tyler Hinman, five time world Crossword puzzle champion, I am not. The hardest part about this crossword is actually finding the clues. They come in a 100 page book packed to the gills with questions. If you think you know an answer for an across question and want to cross reference it with the down section, you have to flip through 50 pages to do it. If you're standing on one end of the puzzle and an answer you know jumps out at you, you might have to walk all the way over to the other side, which as we've established can be up to six feet away. Lord help you if you also have to get a chair to reach the upper questions. Although I know I'll never finish this thing without my plan for massive cheating, I have still gained the great fundamental background that a good crossworder gets. But while they might see “muse of poetry” (ERATO) once every other day or so, I've seen it five times on this puzzle. Ditto for STYE and OLEO. At no point in my life will this knowledge come in handy—I don't even know what a “muse of poetry” would do, maybe eat OREOs (also common). These crossword puzzle cliches probably account for 62 percent of the progress I've made on my puzzle. And that is the only way this knowledge has helped me. That's probably just proof that this thing has driven me insane.